When one plans trip to a city that h/she hasn't been before, an important question comes to the mind. What are the transportation options in Barcelona? Is the transportation easy or difficult? Is the transportation is cheap or expensive? We will try to answer all these questions in this article for you. 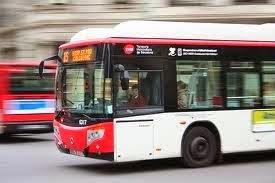 Here we will give information about only buses for public transportation in Barcelona city. Buses in Barcelona city are the main option for public transportation. People in large quantity prefer buses to travel around Barcelona as buses have massive local and interurban network. All buses serving in Barcelona Metropolitian Area are organized by Autoritat Del Transport Metropolita ( ATM). Local bus services are organized by Transport Metropolitans de Barcelona ( TMB). Apart from these, there is night bus service called Nitbus and it's still being set up for a rapid bus service called Retbus which is intent to serve for rapid bus network in Barcelona city. Bus transport system in Barcelona is organized very well. We will give information about both daytime and night buses separately on tickets and methods of Barcelona travel. Barcelona daytime buses connects more than 80 districts and offer comfortable trip for people who have reduced mobility. There is a bus route map plan in the buses and it's hard to say which buses going from A to B. 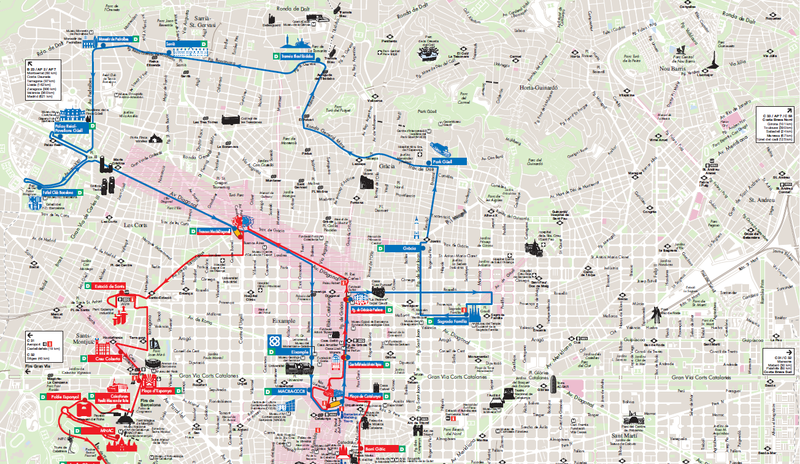 We will give a map about buses route map but you should ask which bus you should take according to your stay in Barcelona city. Beside, route, schedule and prices may change. Many buses serve from 5 or 6 am to 10 or 11 pm and these buses pass through Plaça de Catalunya and Plaça de la Universitat. The Barcelona card offers you cheaper and unlimited on all over the means of transportation in Barcelona city. With these travel cards you can access any other transport systems such as metro, tram, suburban train. There is a travel card called T-10 card which offers day passes ( 2,3,4 or 5 days) or ten journeys. Here you can find Barcelona bus transport official web-site that you can have a look for exact bus route. Here below some card types that you can choose according to your Barcelona Travel. I hope we are able to be your Barcelona travel guide. Below cards are available on all integrated transport system. A multi-person travel card allowing 10 journeys. A holder-specific travel card allowing unlimited journeys. Under 25s can use this travel card to make unlimited journeys over 90 days. An individual travel allowing an unlimited number of journeys to be made in one day. An individual travel card allowing 50 journeys to be made over 30 days. A holder-specific travel card allowing unlimited journeys to be made over 90 days. A multi-person travel card allowing 70 journeys to be made over 30 days. Barcelona night buses start to serve between 10.40 and 11.40 pm until 5.00 and 6.00 am in the morning. The Nitbuses pass through Plaça de Catalunya. These buses are yellow. 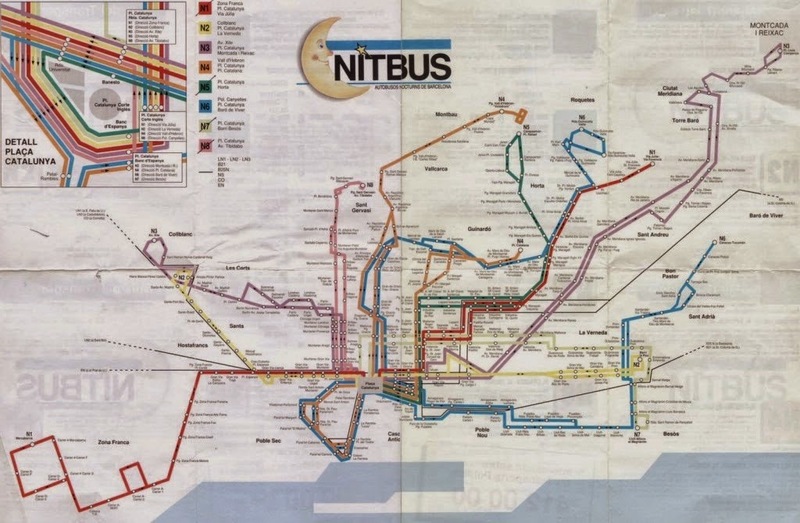 Here is a map of nitbuses in Barcelona city.